The S&P 500 Index closed on Friday at 2,063.50, down 1.26% on the week. The focus last week was on the Fed and 1st quarter earnings reports which, outside of some visible misses on a few large cap stocks, exceeded expectations. Crude oil was strong, trading above $44 a barrel which helped the high yield junk bond market, as the risk of energy industry defaults abated. The stock market which has traded higher on the back of the rally in crude oil these past 2 months has worked off some the the overbought excesses which developed as the current rally defied gravity and continued up without pullbacks. 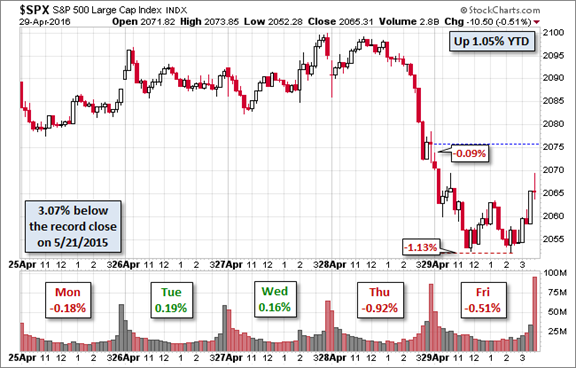 The stock market should attempt to bounce up early this week but May is normally a choppy month so raise some cash on any rallies back toward 2,100 on the S&P 500 Index. The Nasdaq 100 Index (NASDAQ:QQQ) has performed poorly, lagging the overall stock market advance as earnings disappointments in large cap technology stocks have been a drag on the Index. This is fertile ground for raising cash on rallies. However, with unemployment claims very positive, the Federal Reserve Open Market Committee taking a wait and see attitude toward the timing of the next rate hike, strong breadth indicating broad participation in this rally and company reports beating both top and bottom line estimates along with higher guidance there is little reason to expect a big sell-off at this time. The late week dip, triggered by news that Carl Icahn had sold his entire Apple position and then warned of a "day of reckoning," found support in the 2,020 - 2,065 area identified last week. That support area should hold in May while upside is limited to 2,100 in our view…a trading range market that will likely continue. The rally in the S&P 500 Index ETF (NYSEARCA:SPY) ran into resistance once again at the 210 level but breadth is strong as the SPY trades down toward a short-term oversold while Chaikin Money Flow remains bullish. The strong relative performance of the Guggenheim Equal Weighted S&P 500 ETF (NYSEARCA:RSP) vs. the SPY confirms the broadening out of market participation as the rally off the February 11th lows attempts to breakout above 2,100 on the Index. The market is gradually working off the overbought condition above its 50 and 200-day averages. 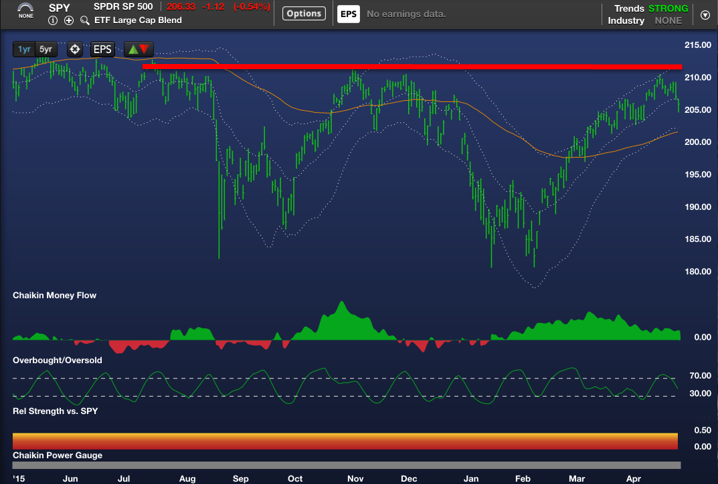 Resistance in the 2,100 -2,135 area remains a challenge for the stock market. As the intra-day chart of the S&P 500 Index below shows, the stock market once again stalled at the 2,100 resistance level. The sharp waterfall decline that began at 2:00 on Thursday was triggered by comments made on CNBC by Carl Icahn regarding liquidation of his huge position in Apple (NASDAQ:AAPL) and a "day of reckoning" for the stock market in general. It should be noted that Icahn has made those comments before, notably on February 24, after which the market rallied 9%. One can only conclude that Carl Icahn is short the market and talking his book. Nevertheless, getting through 2,100 will be a challenge for the stock market in the near term. For more market insights, subscribe to PowerSuite Premium, which includes Marc Chaikin's weekly stock market analysis report, Market Insights. Disclaimer: Chaikin Analytics LLC is not registered as a securities broker-dealer or advisor either with the U.S. Securities and Exchange Commission or with any state securities regulatory authority. Chaikin Analytics does not recommend the purchase of any stock or advise on the suitability of any trade. The information presented is generic in nature and is not to be construed as an endorsement, recommendation, advice or any offer or solicitation to buy or sell securities of any kind, but solely as information requiring further research as to suitability, accuracy and appropriateness. Users bear sole responsibility for their own stock research and decisions. Read the entire disclaimer.